Sophie Bartlett’s work encompasses landscape, still life and figurative subjects, and she describes it as loosely impressionistic. 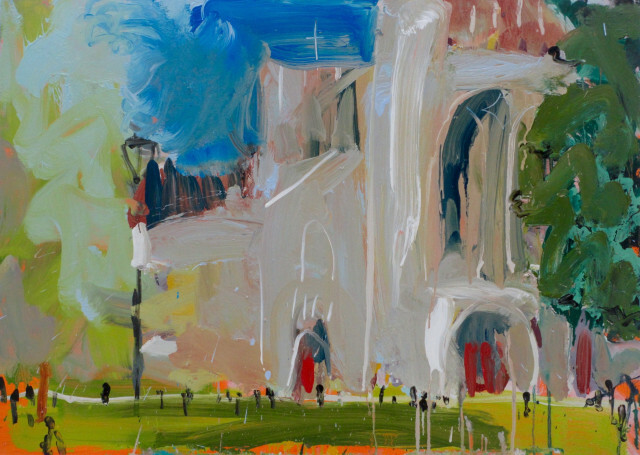 Though much of her inspiration comes from the countryside, she is also fascinated by urban and industrial landscapes, sketching and painting subjects as diverse as cathedrals, construction sites and dockyards. Sophie Bartlett works in a variety of media, but over the last few years she has found it hugely exciting to rediscover watercolour, inspired and encouraged along the way by fellow artist Anthea Stilwell. Sophie likes the quality and translucence of watercolour on paper, and has begun combining this with collage, adding found pieces of coloured paper and pattern to provide contrast and texture. Drawing on her strong visual memory, she will often introduce colour combinations remembered from elsewhere into a current painting. As well as using watercolour, charcoal, ink and wax, Sophie Bartlett has recently started working with oil paint and is very excited by the possibilities this presents for the future.